Chinese chives are at their best in spring, when the leaves are young and tender. A vigorous rinse under cool water, followed by peeling off the outermost leaf (or two) will give you a clean white shaft. After cleaning, roll damp garlic chives in a paper towel and place it inside a plastic bag in the refrigerator. Use harvested garlic chives within three days. 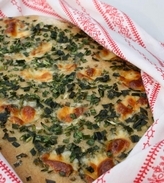 Garlic chive focaccia got good reviews at my house, teamed up with a salad made from garden-fresh greens. Wouldn't it be great to eat something from your garden every day of the year? That's the idea behind my newest book, Homegrown Pantry. Check it out! The onion family fascinates me, and I've been growing garlic chives (Allium tuberosum), also known as Chinese chives, off an on for 30 years. Garlic chives lead a double life as a big-flavor herb with potent nutraceutical properties and a late-blooming perennial flower. Growing garlic chives to make the most of both talents is easy! 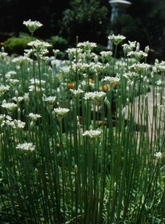 I grow garlic chives in the herb garden and the perennial bed, too. True to their Allium tuberosum name, garlic chives grow into clumps with thicker roots than is typical in the onion family. Tremendously cold hardy, garlic chives are among the first perennials to emerge in spring, and leaves are ready to pick by the time the early daffodils are in bloom. 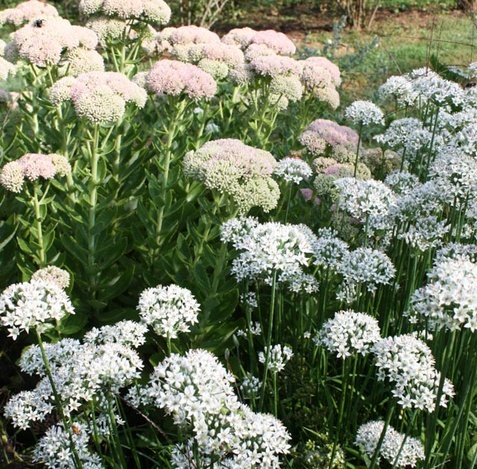 The flowers come much later, in August, when the white flowers with a light lilac scent provide nectar for beneficial insects. They make great cut flowers, too! In my perennial bed, I like growing garlic chives with showy sedum or 'Party Girl' Japanese anemone, which bloom at about the same time. Asian dipping sauces that normally call for scallions take off in a new direction when infused with plenty of Chinese chives. I favor the Korean approach, which involves searing chopped Chinese chives in sesame oil for less than a minute before mixing them with soy sauce, rice wine vinegar, a touch of honey, and lots of red pepper flakes. Pot stickers and dumplings are open to endless interpretations because garlic chives combine well with shrimp, pork or braised tofu. Chinese chives with scrambled eggs is a classic dish that must be enjoyed at least once a year. Saute chopped garlic chives in butter until soft, then add beaten eggs. Garlic chive quiche or tart is always a possibility, with Guyere most often recommended as the cheese of choice. Garlic chive pesto might be in order if you needed to use a lot of garlic chives, or you can make a Chinese chicken noodle soup with seasonal spring greens like spinach, mizuna or Chinese cabbage. Regarded as a warming food in Chinese medicine, garlic chives can turn a simple miso soup into something special. 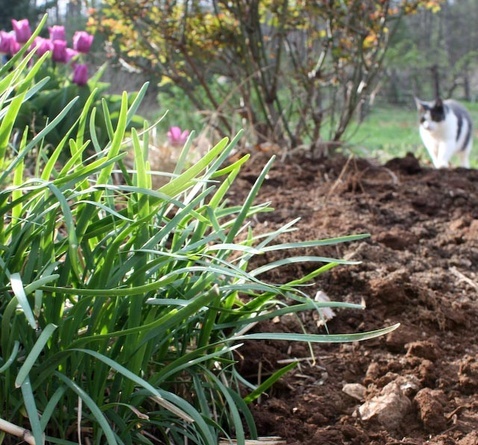 One of the quirks about growing garlic chives is that volunteer seedlings can become invasive, especially in cold climates. Gathering the flowers as for indoor arrangements nips this problem in the bud, or you can wait the cut back the blooming stems just as the flowers fade.